Spring is here. 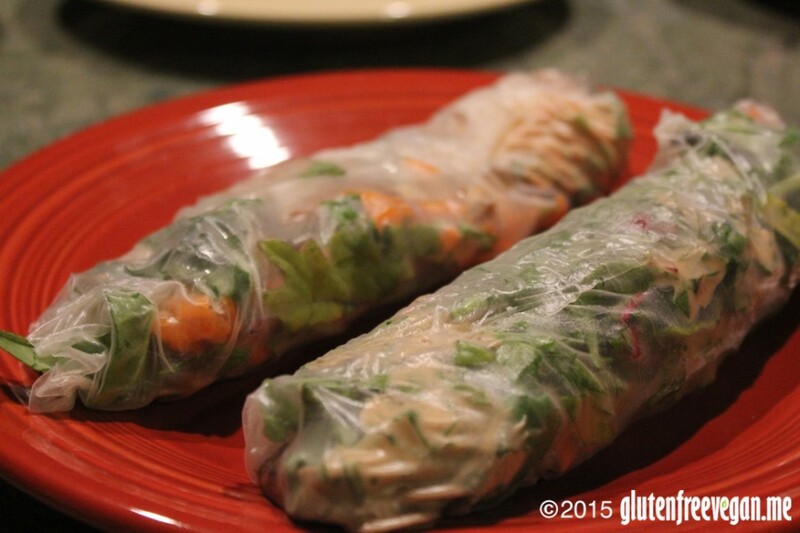 What a great time for spring rolls! Actually, pretty much anytime is a great time for spring rolls if you ask me. If you’ve never made them, they are tons of fun – but there are a few important things to know first. 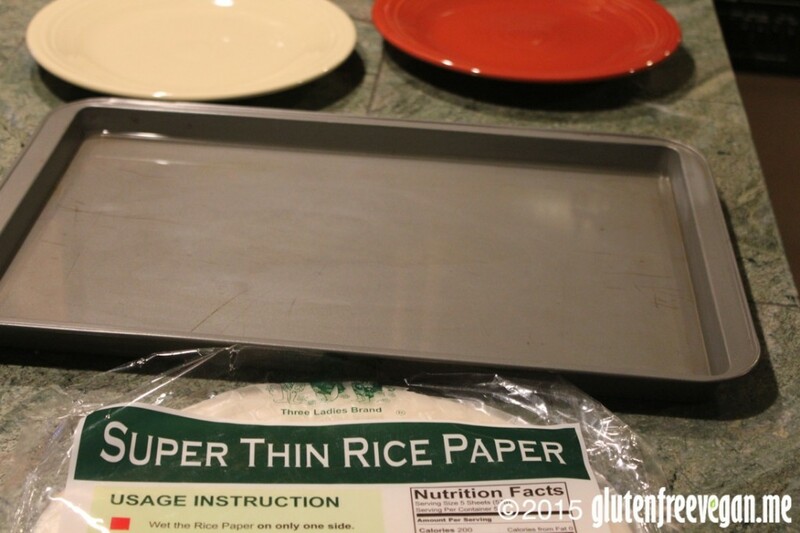 We use a cookie sheet with a ½ inch edge filled with water as our rice paper soaker. The rice paper gets very soft, very quick. Don’t get it too wet or soak it too long. Package says to only wet on one side. I think this is a good idea if you’re making them to share later. If you’re making them to eat now, wet both sides quickly, let the water drip off, transfer to your plate and start filling them up. Another thing – don’t fill too full. They are quite strong, but do rip if they are over-filled. Also, cut your fillings into bite sized pieces to make them easier to eat. 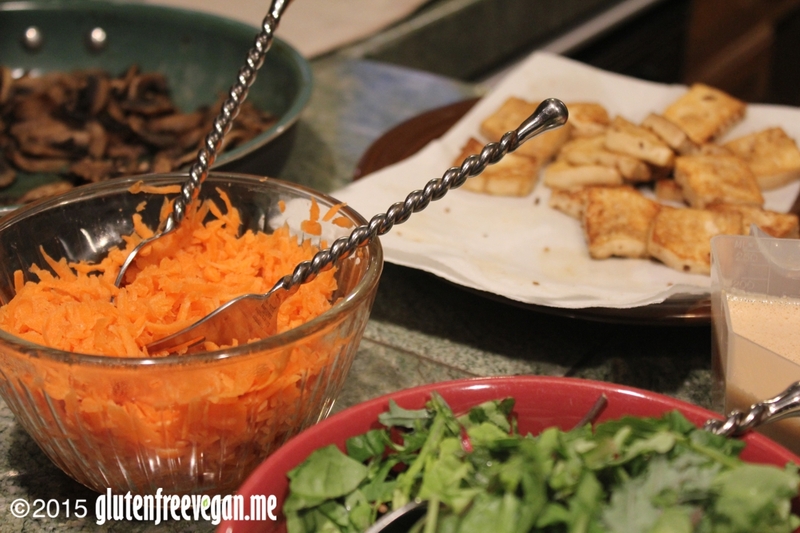 Tonight we made ours with chopped greens, shredded carrots, marvelous mushrooms, fried tofu and homemade peanut sauce. I’m still perfecting the peanut sauce. Recipes for the tofu and mushrooms can be found by clicking on the links above. What makes spring rolls fun is deciding what you want in yours. Have fun, get creative and share your ideas below! This entry was posted in appetizers and snacks, main dishes, side dishes, Vegan Information and tagged Asian, gluten-free, glutenfreevegan.me, glutenfreeveganme.com, healthy, spring rolls, vegan cooking, vegan recipes. Bookmark the permalink.